Place: Two Dales School, Darley Dale, Matlock. 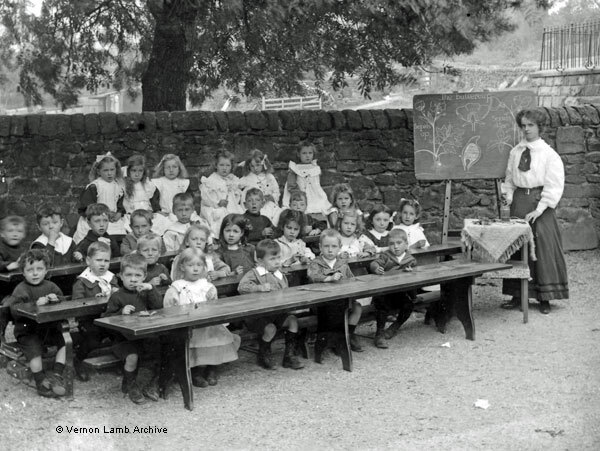 Description/Historical Information: Young female teacher, Miss Wagstaffe, with class of 28 young pupils sitting on forms behind long tables under a tree. The words on the blackboard read The Buttercup. The teacher has drawn buttercups on the blackboard and labelled the drawings sepals up and sepals down. The children all have specimens in front of them [also see VLA5220 and VLA5231]. A postcard that shows the front of the school is elsewhere on this web site.